When I first brought Tess home, having never had a dog before (and really never being responsible for another life), I was worried about losing her. After thinking I lost her within my apartment our first day together, this didn't seem so illogical. So when one the ANNA Shelter's rabies & microchipping clinics came up, we made sure to get a spot in line. For 20 bucks, they microchipped Tess and sent us with the info to register it through Avid PetTrac. When we moved, however, it took us almost a year to get our address changed. At the time, you had to call or request by mail to have your info updated...and we just...never did. When we brought Ed home and had him microchipped during his neuter surgery, we called to ensure both of their info was correct. We made sure to print off their chip information and put it in their binders for quick reference, especially if we ever need to update again. Is your dog microchipped? Is his information up-to-date? While we do what we can when planning routes to avoid surprises, you can't always account for everything. This week was a good reminder on the importance of being flexible. After running into a couple off-leash dogs (and a less-than-helpful owner), we had to turn our whole group around and find an alternative route. Our path back wasn't the most scenic or ideal, but it got us there without incident. 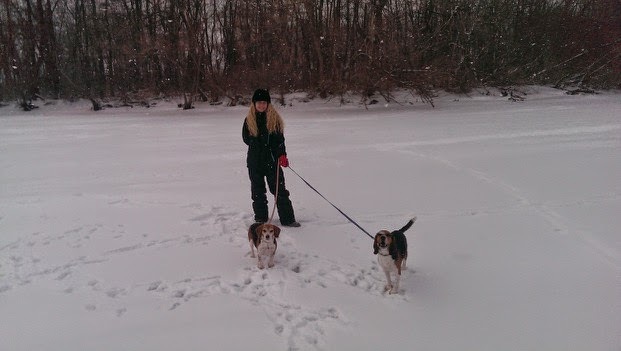 And our dogs didn't mind one bit. Have your walk plans ever been derailed? How did you get back on track? Every once in awhile, one of us (humans) is required to go out of town for work. This leaves the other home alone with the pooches. 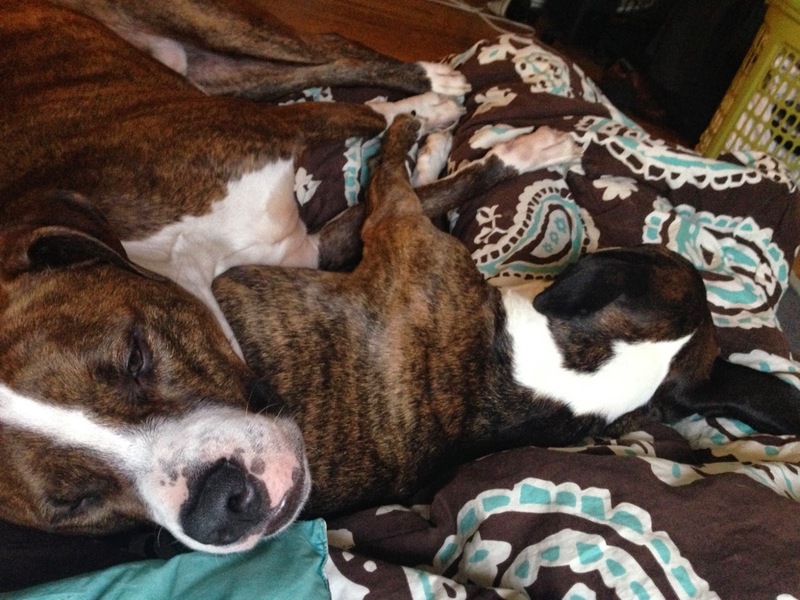 And while this is great (hello, snuggle partners! ), it also means more work for the one at home. And while being the sole provider of food, treats, and pets is not a huge burden, taking both pooches for walks can be. When we're together, Sam & I can tag team walks; when one of us is traveling it either requires twice the amount of walks or walking two pooches at once. While this was nearly impossible before we got both pooches to walk nicely on lead (most of the time), individual leash work over the few years has made walking both pooches at once do-able. It takes so much more focus on all three of our parts, but it's much better than twice the walks. 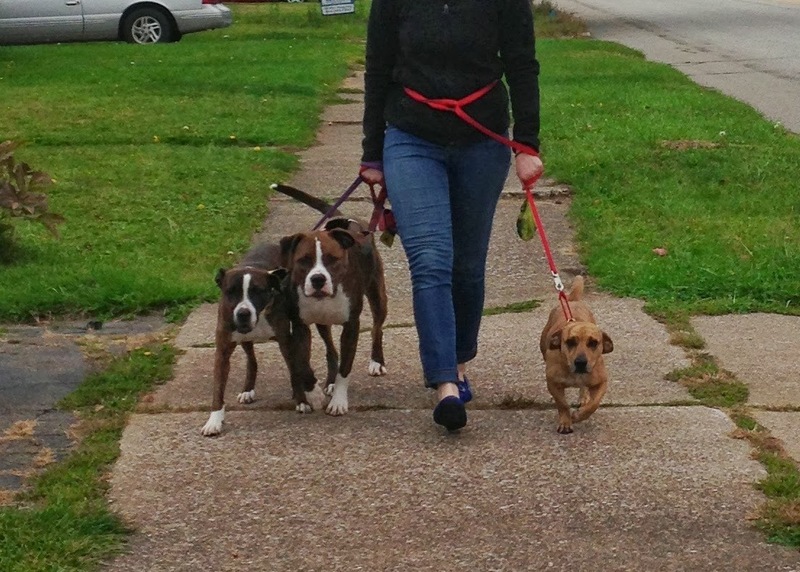 Do you every have to walk two pooches at once? What's your secret? Although we didn't have a walk this week due to the holiday, we thought we would share a guest post from Gemma's person on her experiences walking in our pack. Gemma's family recently added a new pooch to their family -- who just so happens to have one of the cutest block heads we've ever seen! I became a first-time dog owner in August 2011 - having grown up in a house with a strict "no pet" policy. Was I afraid of dogs - afraid of the extra work it would take? Once committed, I dedicated myself to finding the best ways to live with, train, and understand my dog. 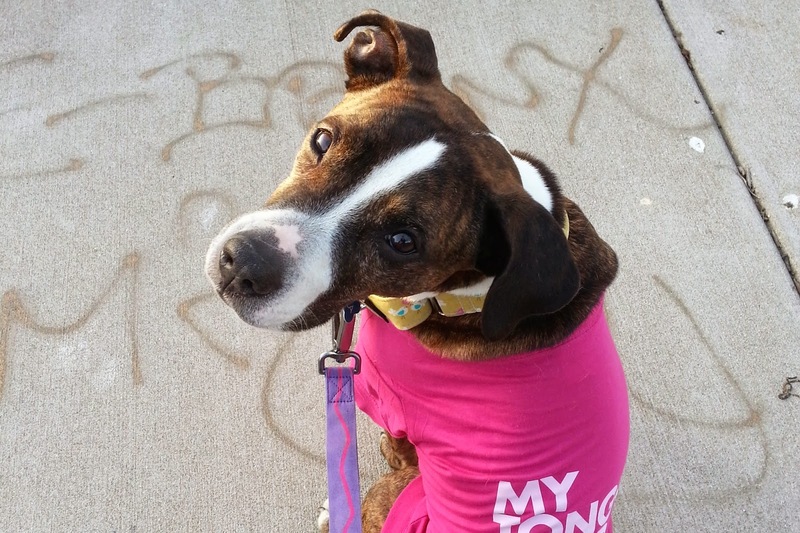 Gemma is a spirited, loving creature and I want her to be happy, healthy...and well-behaved. One of our greatest challenges has been walking nicely on a leash. Gemma is darn-near perfect when the streets are quite and the sidewalks are empty. Our early morning walks - the ones where we see only one to two human/dog combos - have been the most successful. Adding bunnies, kids on bikes, and other four-legged distractions increases her excitement...and my anxiety. 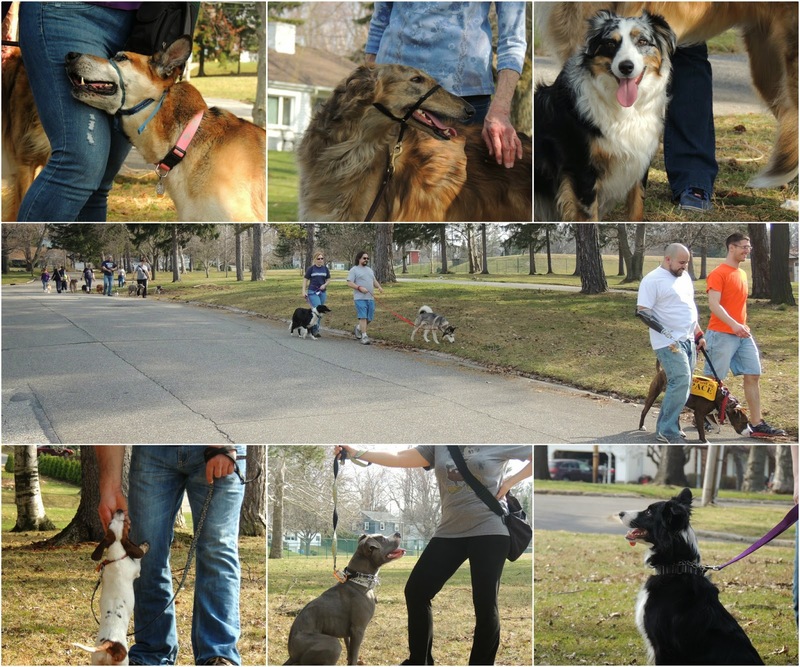 I combed the internet and asked lots of questions of people that I feel have been successful dog owners...and that is how I found Pack of Erie Dogs on Facebook. 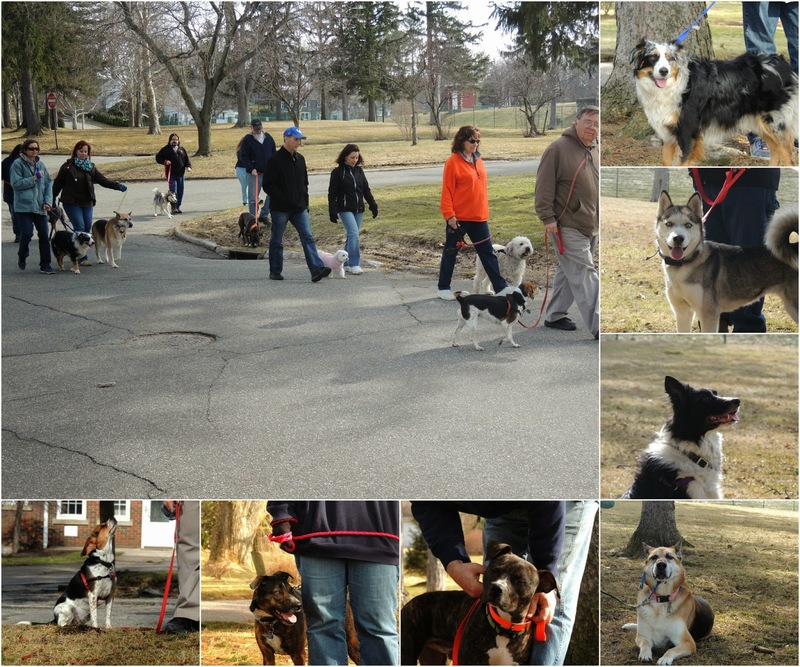 The idea of an on-leash, no-meeting group to socialize & exercise Gemma was just what I was looking for. We started joining the pack last summer, and Gemma's leash manners improved pretty quickly. It was immediately clear that this group does not judge. Every single (human) member knows the anguish of a reactive dog, and it didn't take long to begin to see how well the dogs - with repetition and consistency - have taken to this training. 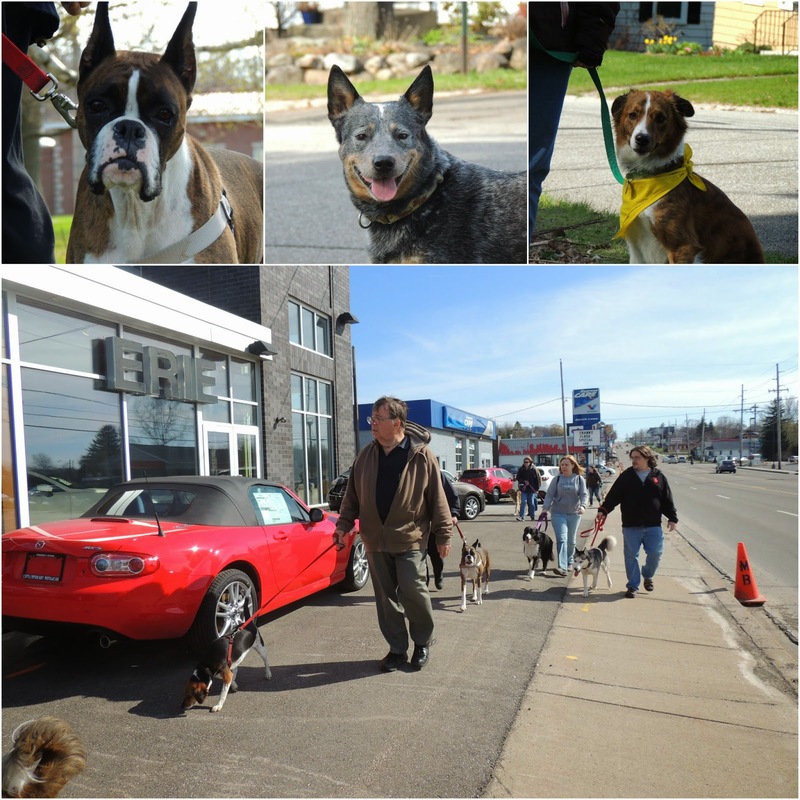 We enjoy being a part of a dog parade! I credit Pack of Erie Dogs with giving me the guts to consider adding a new 4-legged member to our household. Without the encouragement of PEDs, I don't believe I would have gained the confidence to be a better dog owner - one that has found enough room in her heart & home to welcome Diesel to our family. Although the weather this week has leaned more towards winter, we still found a nice evening to explore an area we've been wanting to walk for awhile. We've found that Erie has many small parks scattered across the city. And while they aren't very big, they are just so sweet. This week we loaded up and went to Griswold Place (off 14th and Peach for you Erie folks). Our favorite part is that right around the corner is some amazing graffiti art. We love that this art is allowed to stay and cheer up an otherwise drab train overpass. And of course, a portrait of Erie's beloved Commander Oliver Perry on a stairway. Have you explored anywhere new lately? Do you have any graffiti art murals in your city? 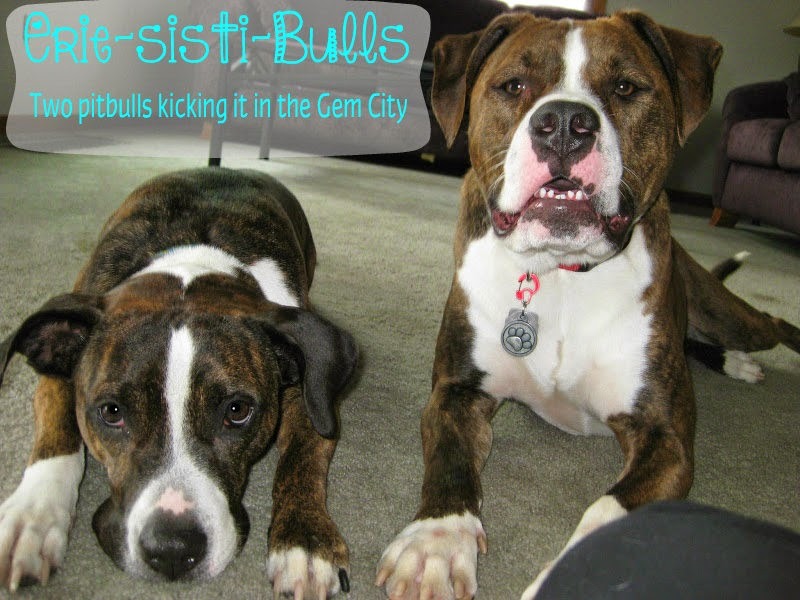 Our friends over at Pocket Pittie in the City recently wrote about living with what they lovingly termed a "leash gremlin." Yep, we've got one. We've admitted before - in our first week home with Edi, we contemplated about taking him back. Thinking about it breaks my heart. We almost missed out on a truly special dog. And not only would we have missed out on Ed himself, but all that we've learned and experienced because of him. Having to work harder and tap into more resources has helped us to meet so many new people, start a blog, and create a dog walking group! Do you have a leash gremlin? How do you "deal"? After bringing Edison home and realizing he was a monster (and we use that term so lovingly! ), we were faced with the same question any new owner to a reactive dog faces: "Now what?" We did a lot of reading, a lot of learning, and tried lots of new techniques. And while we definitely improved, we seemed to be stuck. We needed to socialize a dog who couldn't socialize. We worked with what we had, but it really just wasn't fulfilling our need. We read about walking groups in other cities and realized that was what we needed. 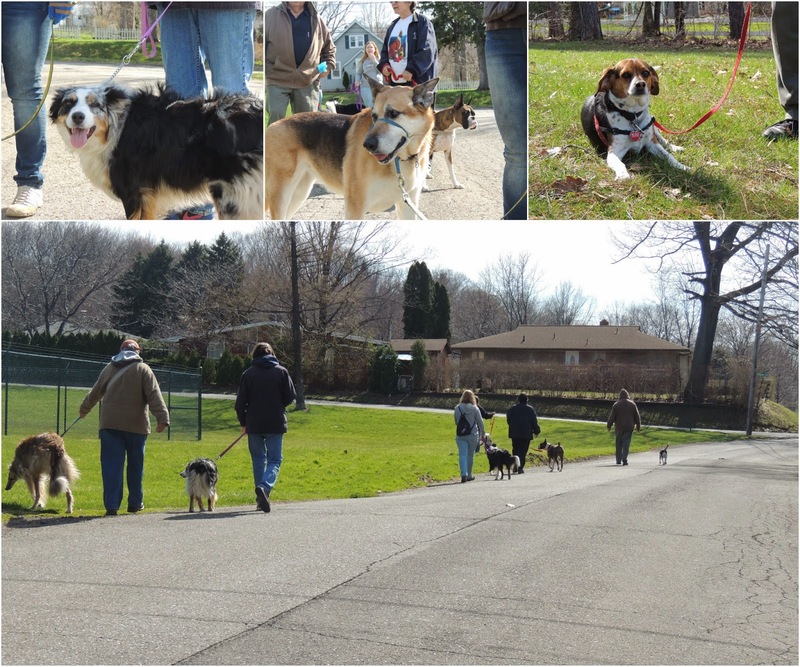 We figured that we couldn't be the only ones that needed a dog walking group either. Almost a year later and we've realize how true that statement is. We've gotten so many new members who just needed help getting started in the long road to socialization for a reactive dog. And although it's not the easiest road, it's much better with a great support group. Have you ever been faced with the "now what" question? What did you do? One thing that we're looking forward to now that spring seems to finally have sprung is getting back into our weekly family walks. We try to use these walks to not only spend quality time together, but also to explore a new location. Although this week, we opted to walk around our favorite park, just a short jaunt from our house. We're looking forward to many more walks to come and already have a few new places lined up that we'd love to explore! 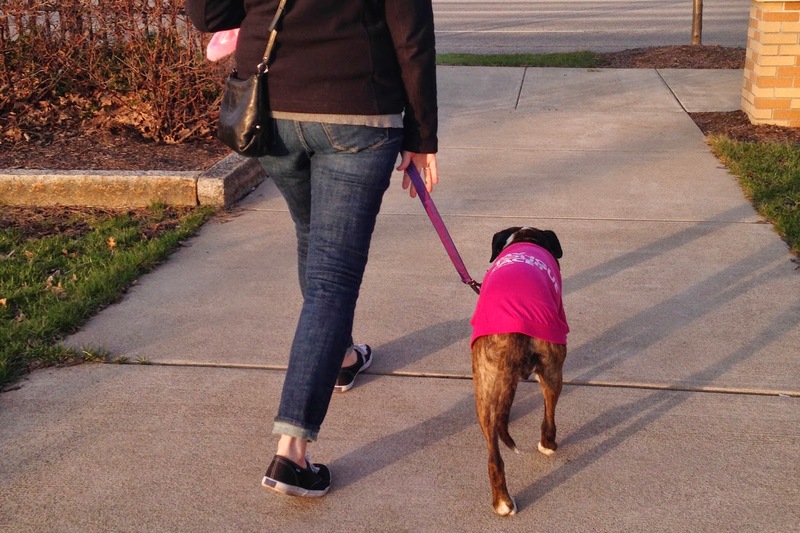 Have you and your pooch walked anywhere new and interesting lately? Although Edison still had some growing to do when we got him, we feel like he somehow keeps getting bigger. Maybe its a combination of slimming down and bulking up. Whatever it is, we're worried they will be making a children's book that would be titled Clifford and the Vanishing Dog -- where a brindle dog keeps growing and growing until he's as big as a house and meets a friend who keep shrinking smaller and smaller until she disappears! Although a children's book about our two best buds might not be that bad!! 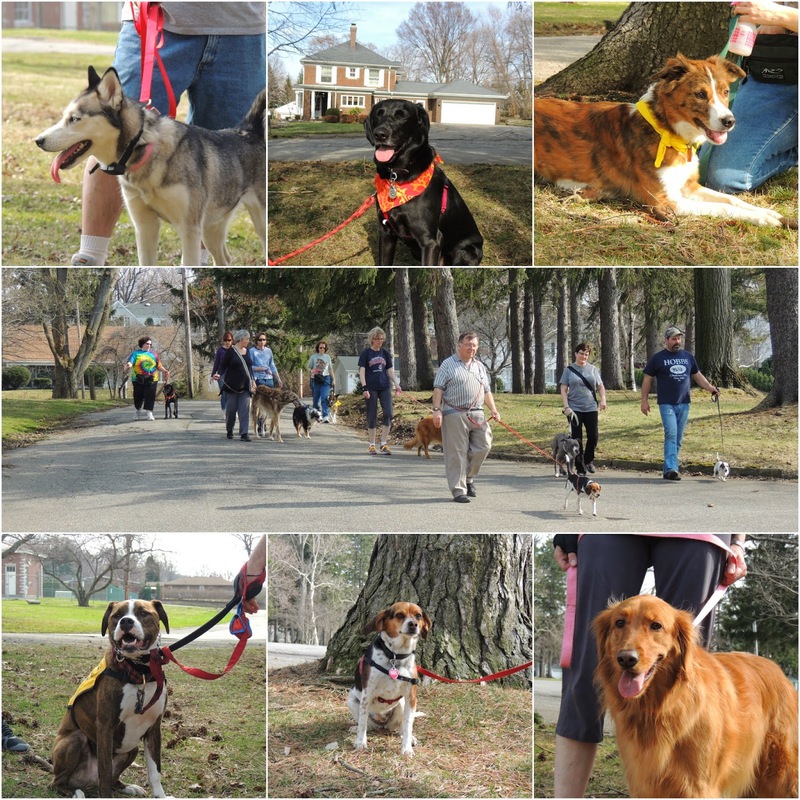 We've spoke of the many benefits of our pack walks when it comes to the pooches: passive socialization, confidence building, and increasing the human-canine bond. But one thing we've not talked about as much is the socialization benefit for the humans. 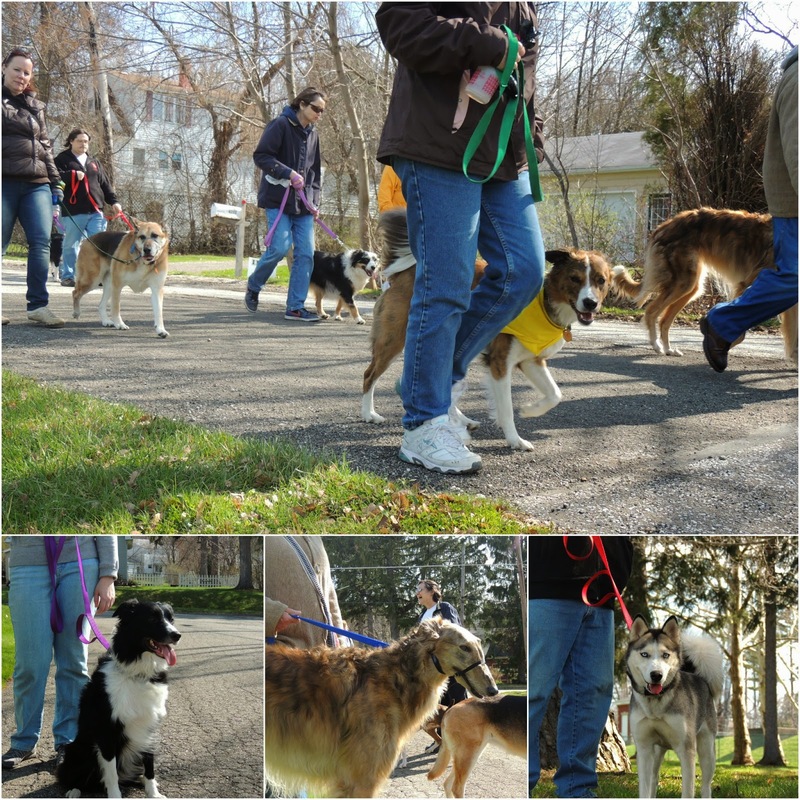 Our weekly walks allow the human side of the leash to branch out and meet new people. And while we all have one thing in common -- a love for our dogs! -- we're a very diverse group from all parts of our shared community who otherwise might never cross paths. But together, we can share advice, cheer each others' successes, and just generally enjoy the company of people who love to hear about our pooches. How do you socialize with other dog lovers in your area? 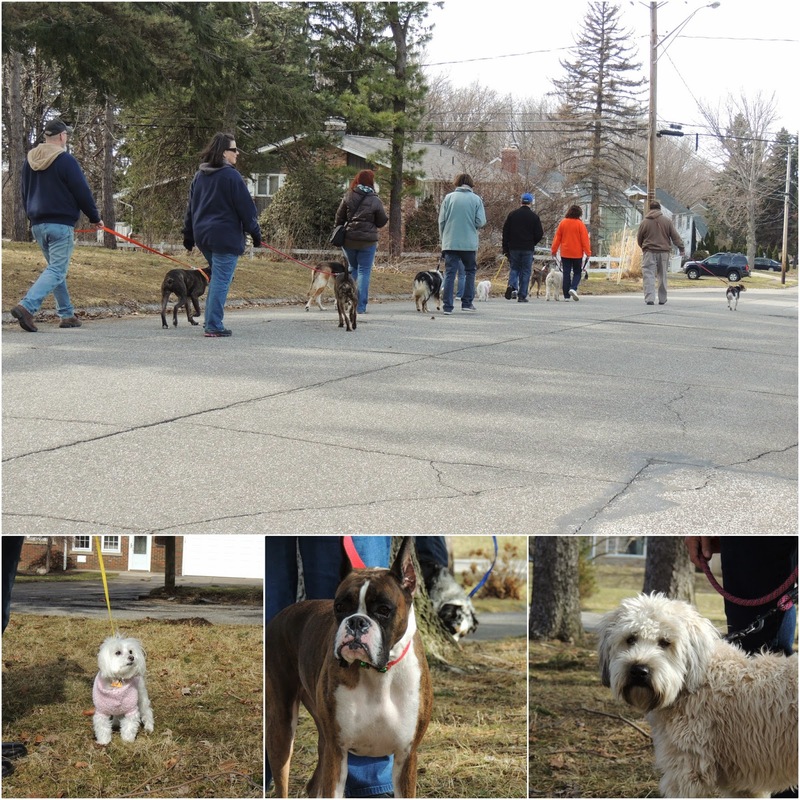 We've talked about how our weekly pack walks helped us stay "in shape" for the warmer weather ahead. One thing that we need to work on as we spend more time outside is Edison's fence running. We have a 7' privacy fence that runs around 2 sides of our yard - one side being a semi-busy road with a bus stop. With Edison's territorial-ness, along with the foot traffic and bus riders outside our fence, we get a lot of barking and fence running during the summer -- as evident by the path worn along the fence. So this spring, we're planning on getting to work on this bad habit. Has anyone dealt with this? What steps did you take? Our Foster: Toby - AN UPDATE! Last year, we emailed our foster Toby's forever family to check in. 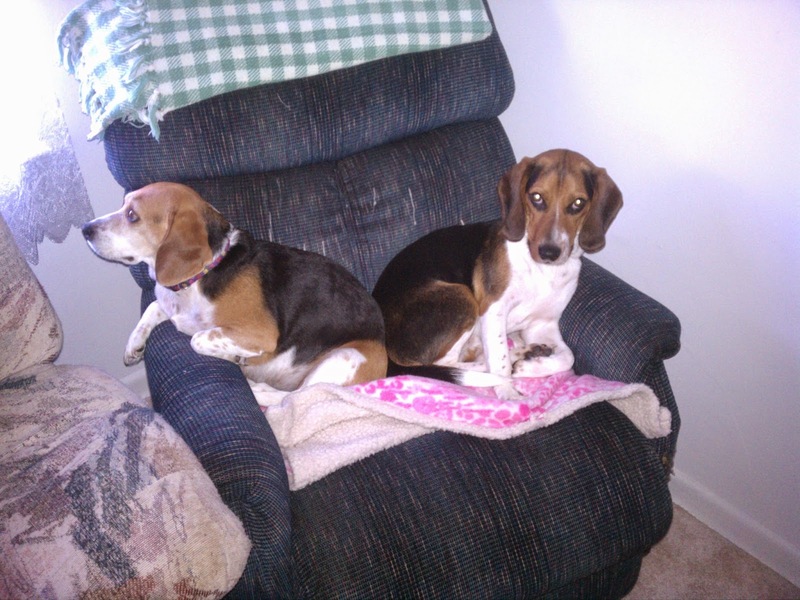 They recently shared with us how Toby and his sister Abbey are getting along. You'll be happy to know that Toby is a perfect fit for our family! He is such a lovable, cuddlable, smart boy! 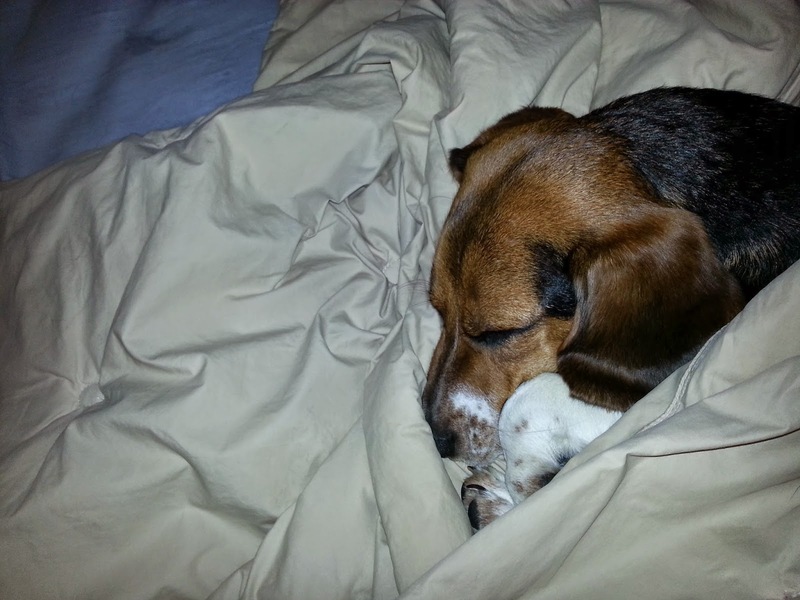 He has another beagle named Abbey to play with and to fight the heaters for! 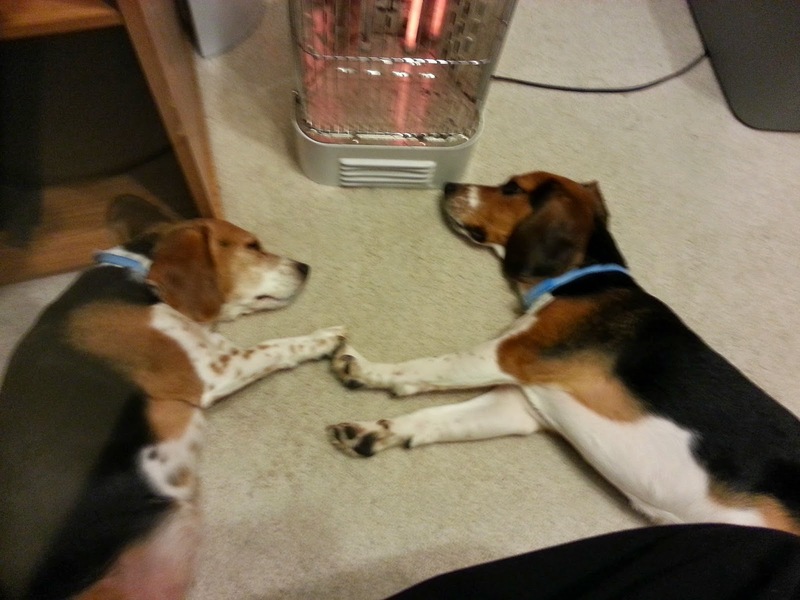 Him and Abbey are heat hogs; they will try to nudge each other sometimes to steal heat from the vents! Needless to say, they do not appreciate the cold weather. Toby and Abbey both snuggle up to us at night and usually sleep right between me and my husband! (Usually Toby is cuddled up in my arms!) He is a good boy who brings much job each day to our family. His favorite toys are anything that he can tear a squeaker out of, but only if it is soft; no rubber toys for him, he says! Also, if any time of the day anyone sits on the floor, the couch, a chair, or almost anything, Toby will be right in your lap! I love it! Again, I want to say we are so thankful for Toby; he is a perfect fit for us. Isn't it funny that I didn't want a second dog in the first place, but now I could not imagine my life without him right now!? 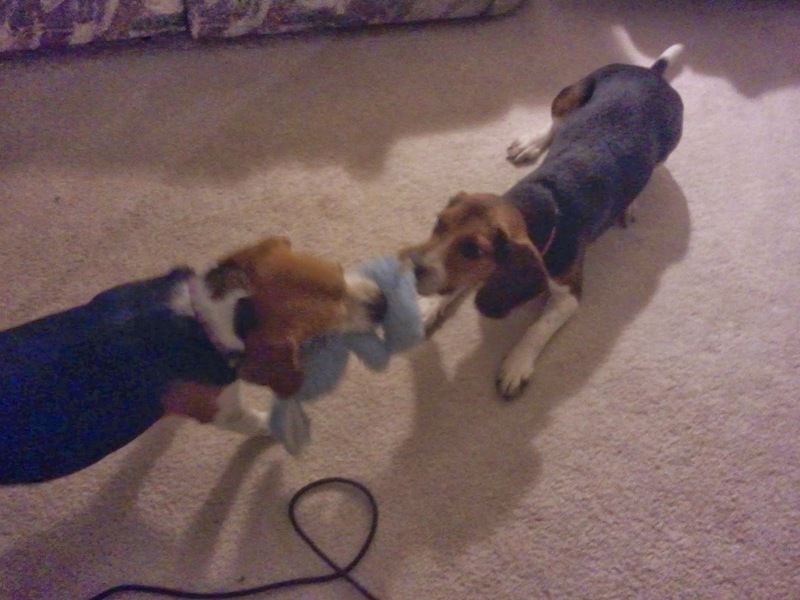 The beagle I brought home ended up liking Joe more, and the beagle Joe brought home likes me more! I am very thankful to have Toby in my life; he has brought much energy and happiness to our family. We are so happy Toby found his perfect family and that they love him just as much as we do!